Ensuring a continuous supply of young jazz musicians in the German ‘bundesland’ Hessen is a demanding and complex challenge. 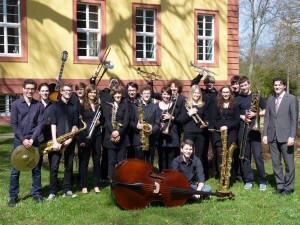 For almost 30 years, Wolfgang Diefenbach, winner of the Hessen Culture Prize, and the Hessen State Youth Jazz Orchestra (Kicks & Sticks) have been synonymous with jazz training at the highest level. When he initiated the Junior Band, which offers excellent musical training for youngsters up to age 18, Wolfgang Diefenbach laid another stepping-stone in the path leading all the way up to professional jazz and big-band careers. This seamless education from earliest teenage up to early adulthood is unique in Germany. The Junior Band has now been in existence for six years. Founder Wolfgang Diefenbach: “The most important function of the Junior Band is to discover exceptionally talented youngsters very early and to coach them so that they can continue in the very successful tradition that Kicks & Sticks has established.” About 50% of the musicians in Kicks & Sticks are already coming up from the Junior Band. Since 2008, 379 young musicians have played in the Junior Band, which is currently under the leadership of Dr. Holger Fröhlich and has 34 members. Youngsters can join the band at a minimum age of 12 or 13; at the age of 15 most of them can move up into Kicks & Sticks. The young musicians are fortunate to have the opportunity to work with outstanding international tutors, and to play in exclusive concerts. Both of the youth bands — Kicks & Sticks and the Kicks & Sticks Junior Band — take part simultaneously in the workshop sessions during the Easter and autumn school holidays, so there are plenty of opportunities to get together and swap ideas. Altogether, the youngsters get a solid musical education, with the possibility of attaining professional quality, in surroundings that motivate and inspire them to make great jazz. The big-band plays in the classical formation with four trumpets, four trombones, five saxophones and rhythm group. The Hessen State Youth Jazz Orchestra was fortunate to be able to engage ex-band-member Dr. Holger Fröhlich as band leader of the junior version of the big-band. Holger, who is the recipient of German state and federal prizes, is a saxophonist who studied music education, jazz and mathematics at the Mainz University (saxophon with Thomas Bachmann, Paul Heller and Steffen Weber; arrangement with Joachim Ullrich and Ed Partyka). In addition to his day job as teacher of music and mathematics at the Tilemann School in Limburg, Holger works as a saxophonist, arranger and band-leader and also teaches at the Hochschule für Musik Mainz [Mainz School of Music]. His work as an educator, in particular for the use of digital media in schools, has been rewarded several times with German, European and international prizes.